Vancouver, B.C., January 16, 2019 – Titan Mining Corporation (TSX:TI) ("Titan" or the "Company") today provided an update on its exploration program at the Empire State Mine ("ESM"). In the fourth quarter of 2018, the program focused on the down-plunge extension and infill drilling of the #2D zone. This zone is an extension of the large #2 mine which accounted for approximately half of the tons mined historically at ESM. The #2D zone and the #1D zone, which lies stratigraphically below, both contain unmined historic mineralized material. Exploration drilling continues to expand the #2D mineralized zone down-plunge to the northeast and laterally. 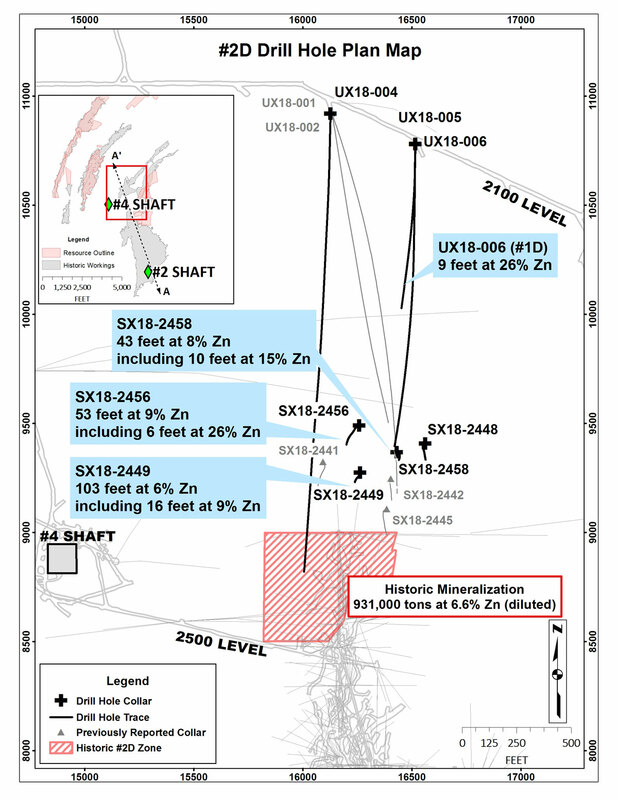 To date, the #2D zone has been extended by over 1,380 feet down-plunge from the historic mineralization, including an additional 660 feet from the previously-announced major expansion of the zone (refer to news release dated November 14, 2018). The assay results highlighted in this news release are from both step-out and infill drill holes which intersected multiple mineralized horizons, and demonstrate the continuity of mineralization along strike and laterally in the #2D zone. The location of this zone, approximately 650 feet east of the #4 shaft and at an elevation above the bottom of the shaft, is expected to provide strong operational advantages. The recent drilling also intercepted high-grade mineralization in the #1D zone, located approximately 275 feet below the #2D zone, and in the same stratigraphic layer as the historic #1 mine. This mineralization, believed to be the down-plunge portion of the #1D zone, is one of several targets that are located close to the current mine infrastructure and have the potential to increase the near-mine mineral resource base. "The recent drilling has more than doubled the strike length of the historic #2D zone and confirmed the continuity of mineralization," said Scott Burkett, Vice President, Exploration. "Our drill results to date clearly indicate that there is potential to double or even triple the tonnage of the #2D historic unmined mineralized material of 931,000 tons at a fully diluted grade of 6.6% zinc. We are also excited about the 2019 exploration program that will test a number of new district targets and near-mine zones that could further extend the mine life at ESM." Donald Taylor, Chief Executive Officer of Titan, commented, "The #2D zone is a low cost development opportunity which will allow mine production to be expanded at ESM, utilizing excess capacity in the mill. Now that we have laid the foundation for near-term growth at ESM, we can focus more fully on our numerous high priority exploration targets to drive longer-term growth and mine life extension in this very prospective district." 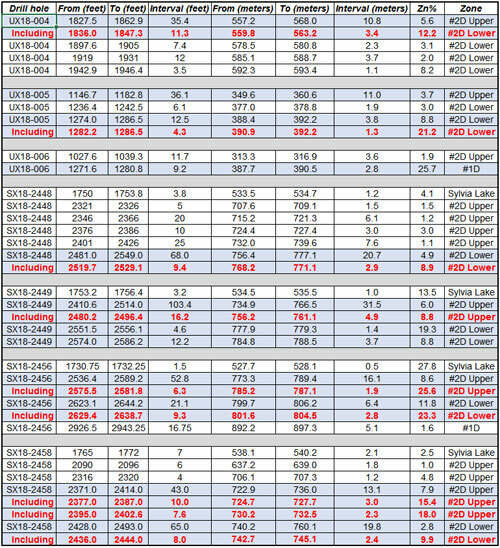 For a full list of the #2D, #1D and Sylvia Lake mineralized intervals from these holes, refer to Table 1. Figure 1 is a plan view of the #2D zone showing the location of the drill holes and selected significant mineralized intervals. 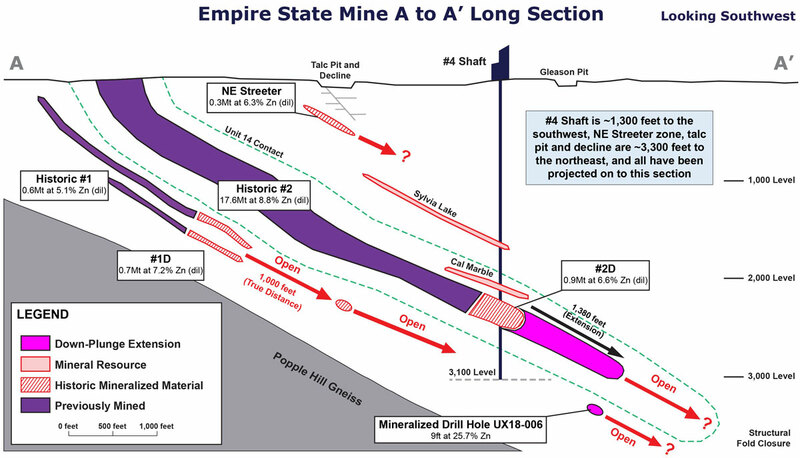 Figure 2 is a schematic long section looking southwest, showing the #2D zone and other near-mine mineralized zones at ESM. The 2019 exploration budget at ESM is US$9 million. In the first quarter of the year, Titan plans to spend approximately US$3 million on exploration drilling to test near-mine and district targets. The district exploration program targets areas that have the potential to host deposits of at least five million tons with an economic grade. High priority targets include Talcville and Cronus where talc deposits have been mined historically and may be the alteration product of a mineralizing event. In the area around the historic Edwards mine, untested targets occur in the favourable marbles that host the mine. Drilling continues with five exploration drills. During the first half of 2019, Titan expects to complete an updated mineral resource estimate and development plan for the #2D zone. As previously announced, Titan's Executive Chairman committed to financing the Company's operations into 2019. In that regard, the Company and a company controlled by Titan's Executive Chairman (the "Lender") entered into a second ranking secured credit facility of up to US$18.7 million, maturing in December 2020. US$3.7 million of such facility bears interest at 8% per annum with the remaining US$15.0 million accruing interest at a floating rate equal to 7% plus LIBOR per annum. The Bank of Nova Scotia has consented to this facility provided it is subordinate to its existing first-ranking credit facility provided to the Company in the first half of 2018. In consideration for the facility, the Company also agreed to issue to the Lender an aggregate of 2,500,000 warrants (the "Warrants") with each Warrant being exercisable for one common share of the Company for a period of five years, at an exercise price of CAD$1.40. Note: It is not possible to determine the true width of the zone(s) based on the drill density and no representation is made here regarding true width of the zone(s). 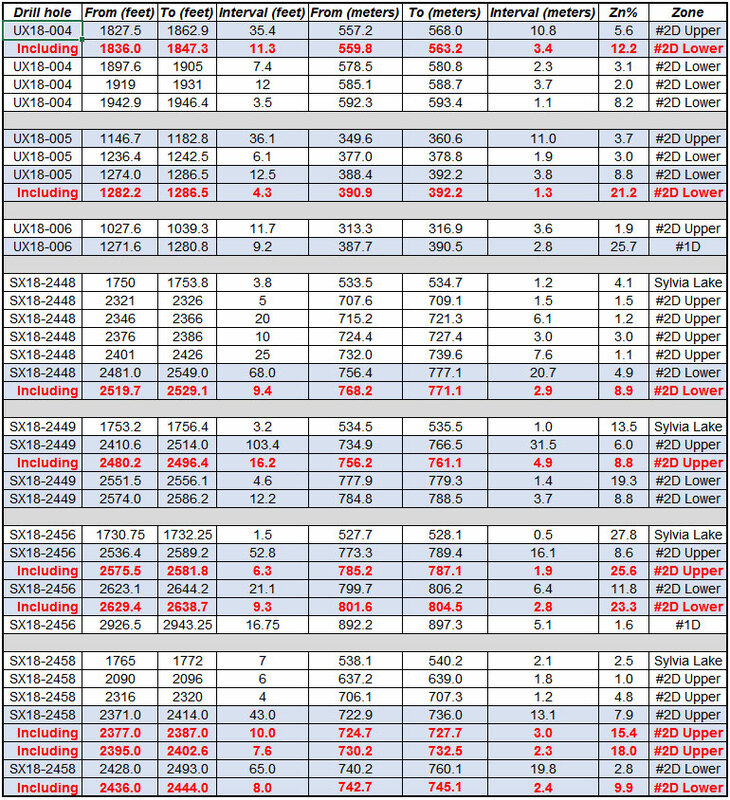 The results of the Titan drilling have been reviewed, verified and compiled by Donald R. Taylor, MSc., PG, Chief Executive Officer of Titan, a qualified person as defined by National Instrument 43-101 (NI 43-101). Mr. Taylor has 30 years of mineral exploration and mining experience, and is a Registered Professional Geologist through the SME (registered member #4029597). To ensure reliable sample results, the Company has a rigorous QA/QC program in place that monitors the chain-of-custody of samples and includes the insertion of blanks and certified reference standards at statistically derived intervals within each batch of samples. Core is photographed and split in half with one-half retained in a secured facility for verification purposes. Sample preparation (crushing and pulverizing) has been performed at ALS Geochemistry, an ISO/IEC accredited lab located in Sudbury, Ontario, Canada. ALS Minerals Laboratories prepares a pulp of all samples and sends the pulps to their analytical laboratory in Vancouver, B.C., Canada, for analysis. ALS analyzes the pulp sample by an aqua regia digestion (ME-ICP41 for 35 elements) with an ICP – AES finish including Cu (copper), Pb (lead), and Zn (zinc). All samples in which Cu (copper), Pb (lead), or Zn (zinc) are greater than 10,000 ppm are re-run using aqua regia digestion (Cu-OG46; Pb-OG46; and Zn-OG46) with the elements reported in percentage (%). Silver values are determined by an aqua regia digestion with an ICP-AES finish (ME-ICP41) with all samples with silver values greater than 100 ppm repeated using an aqua regia digestion overlimit method (Ag-OG46) calibrated for higher levels of silver contained. Gold values are determined by a 30 g fire assay with an ICP-AES finish (Au-ICP21). Titan is an Augusta Group company which produces zinc concentrate at its 100%-owned Empire State Mine ("ESM") located in New York State. ESM is a group of zinc mines which started production in the early 1900s. Titan is built for growth, focused on value and committed to excellence. The company's shares are listed under the symbol "TI" on the Toronto Stock Exchange. For more information on the Company, please visit our website at www.titanminingcorp.com. This news release contains certain forward-looking statements. Words such as "expects", "anticipates" and "intends" or similar expressions are intended to identify forward-looking statements. Forward-looking information is necessarily based on a number of opinions, assumptions and estimates that, while considered reasonable by the Company as of the date of this press release, are subject to known and unknown risks, uncertainties, assumptions and other factors that may cause the actual results, use of proceeds or timing of events to be materially different from those expressed or implied by such forward-looking information, including but not limited to the factors described in greater detail in the "Risks and Uncertainties" section and other sections of the Company's Management's Discussion and Analysis for the year ended December 31, 2017, available at www.sedar.com. No securities regulatory authority has expressed an opinion about the securities described herein and it is an offence to claim otherwise. Titan undertakes no obligation to publicly update or revise any forward-looking statements, whether as a result of new information, future events or otherwise, except as may be required by law.